What’s a family photo without a scoreboard in the background? Especially a grand final scoreboard. This is the final photograph of Jesse Marlow’s book Centre Bounce, Football from Australia’s Heart, published in 2003 by Hardie Grant Books. 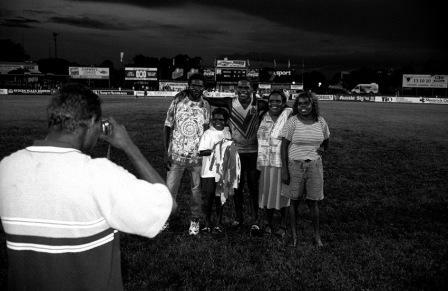 Marlow spent four years travelling throughout the Northern Territory ‘capturing a game that plays an important role in contemporary indigenous Australia.’ Images from Centre Bounce have been exhibited and published extensively, both in Australia and internationally. Jesse Marlow is an award-winning photographer whose work is held in private and public collections across Australia.